Beauty: Why using facial oils can benefit your skin? Facial oils have got so many benefits however still many people that have not tried any. To be honest I have been using them for few years but in the past I believed that oils would give me more acne and breakouts. Well, after trying out different brands I realised it is about what oil you use. There are days where I do not even touch cream and use purely oils for hydrating my skin. And why are they so good? Well, they prevent wrinkles mainly, they hydrate, they protect and some of them can even make your pores smaller. I personally find them somehow soothing. When I was pregnant I was obsessed with oils and also I used oils during my Accutante treatment as the skin was really dry. 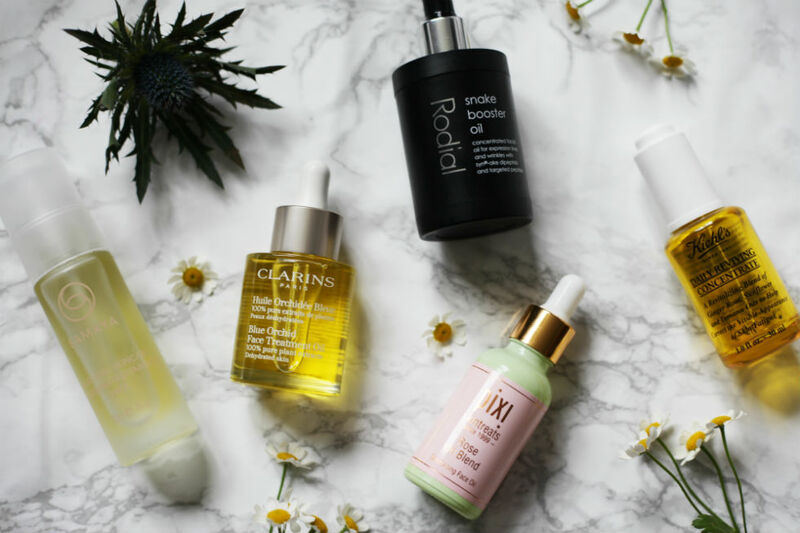 These would be some of my favourite facial oils and there are different reasons why I love them. Samaya Ajurveda – this oil has got definitely one of the more interesting concepts as before you purchase you need to do a test and find out what your dosha is. If you are into yoga and ajurveda this is one thing to try. I was half kapha and vata and picked this one which is more suitable vata purely based on smell preference. It is a gorgeous oil with gorgeous smell and became a big fan very quickly. Clarins Blue Orchid – Face Treatment Oil – I have been using this only shortly but even after few uses I felt a big difference in the morning. Mainly how even the skin tone was and bare in mind I would use it after a night when I had few glasses of wine. It smells very natural and very herbal base so if you like that kind of thing this is the winner. Rodial Snake Booster Oil – This is my old hero product and I still love it. This must be my third bottle and I still use this product. It helps to almost freeze expressions lines and reduce signs of ageing. It is very good before you want to apply your foundation as I do believe there is almost instant effect when it comes to fine lines. Not huge fan of the smell but everything else is top class. Pixi Rose Oil Blend – this oil improves skins elasticity and brings lot of glow. And it does deliver. I had this with me travelling and it worked wonders after full day on the sun. It does not feel greasy whilst it hydrates nicely and I love the smell so much. Kiehl’s Daily Reviving Concentrate – I started to use this product many years ago when I was going through Accutane treatment and it is a wonderful lightweight oil. It is great for daily use, hydrates beautifully and also creates great block from all the radicals around us on a daily basis. Let me know if any of these are familiar or perhaps there are other wonderful oils I should know about. Olejicky na oblicej maji spoustu vyhod a presto potkavam spousty lidi, kteri by si zadny na oblicej nedali. Ja se priznam, ze pred par lety jsem mezi ne patrila. Myslela jsem si naivne, ze pouzivat oleje bude znamenat akne a mastna plet. Ale spis je to to tom najit takovy, ktery sedi vasi pleti. Dneska jsou dny, kdy si ani krem nedavam a spoleham se pouze na ruzne oleje. A proc jsou tak dobre. Samozrejme si musite najit ten svuj, ale vseobecne krasne hydratuji, chrani vasi plet, bojuji proti vraskam a nektere dokonce dokazi zmensit vase pory. Ja osobne je shledavam hrozne uklidnujici. Kdyz jsem byla tehotna, oleje jsem si vylozene uzivala a take jsem je ve velkem pouzivala behem Accutane lecby. Pokozka byla v te dobe opravdu extremne sucha. Mam vyzkousene spousty ruznych oleju, ale tyhle mam momentalne hodne rada z ruznych duvodu. Samaya Ajurveda – tento olej si vyberete na zaklade urceni vasi dosi. Pokud jste na jogu a ajurvedu a tyhle veci, urcite se na produkt podivejte. V mem testu vyslo, ze jsem napul kapha a vata. A rozhodla jsem se pro vatu jenom diky tomu, ze tento mi vonel vice. A velmi rychle jsem si ho zamilovala. Clarins Blue Orchid – Face Treatment Oil – Tento olej mam ze vsech nejkratsi dobu, ale jsem spokojena. I pri prvnim pouziti jsem videla vysledky a to hlavne v tom, ze pokozka byla mene zarudla a to i po veceru, kdy jsem mela par sklenicek vina. A pokud mate radi vylozene bylinkove vune, bude se vam libit. Rodial Snake Booster Oil – Tento olej pouzivam asi nejdele a je to jeden z mych nejvetsich oblibencu. Je navrzeny tak, ze ma zmirnit vrasky a zpomalit proces starnuti. Ja ho rada pouzivam, kdyz si chci udelat hodne dobry makeup. Mam pocit ze ma temer okamzity efekt a po na naneseni makeupu jsou vrasky mene vyrazne. Takovy docasny botox v lahvicce. Uprimne mi moc nesedi jeho vune, ale fakt, ze uz mam asi treti baleni asi svedci o tom, ze je dobry. Pixi Rose Oil Blend – Pomuze vam vylepsit elasticitu pokozky a krasne ji rozzari a je to pravda. Mela jsem ho sebou na cestach a je uzasny po celem dni na slunicku. A navic krasne voni. Kiehl’s Daily Reviving Concentrate – Tento lehky olej jsem zacala pouzivat prave v dobe, kdyz jsem prochazela lecbou accutanem. A zamilovala jsem si jej. Je prirodni, ma vytazek z korene zazvoru a nadherne hydratuje. Vasi plet chrani a vytvari skvely blok pred skodlivinami, ktere mame kolem sebe. Dejte mi vedet jake vy pouzivat oleje a proc a treba zrovna nektery z techto je take vas oblibenec.